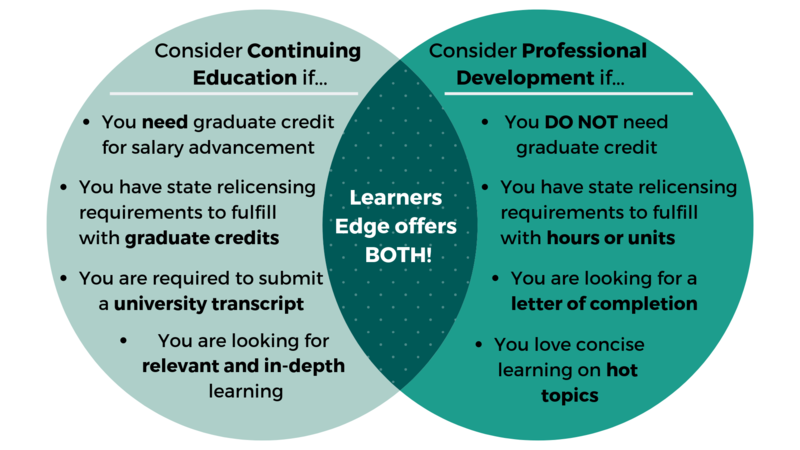 Below is a summary of how Learners Edge may help your continuing education and South Carolina professional certification renewal needs. This summary should in no way release individuals from their responsibility of ensuring that the course they take meets their professional needs. We hope it provides assistance in understanding how Learners Edge might help you in the accumulation of clock hours or graduate credit for salary advancement and the South Carolina teaching relicensure process. See the South Carolina Department of Education website for complete SC teacher relicensure information. Initial Certificate: An initial educator certificate is issued for three years and is non-renewable. The process for maintaining or advancing an initial certificate depends upon an educator's current employment status. After earning three full time years of experience credit within the past seven years in their certification area, South Carolina certified educators employed in eligible, non-regulated educational entities may qualify for a limited professional certificate. Educators working in a public middle or high school setting must satisfy the Jason Flatt Act requirements before their professional certificate can be renewed. Please review the Jason Flatt Act and contact your District Renewal Coordinator for more information. Coursework Pre-Approval: For formal course approval, please submit a detailed course description, including the name of the college or university, along with the Request for Change/Action Form to the DOE. Upon receipt, the course(s) will be evaluated by a certification analyst and correspondence will be mailed to you regarding the results.